Anybody know what this is a picture of? I wouldn’t know what this is except that I live with someone who exposes me to such things. 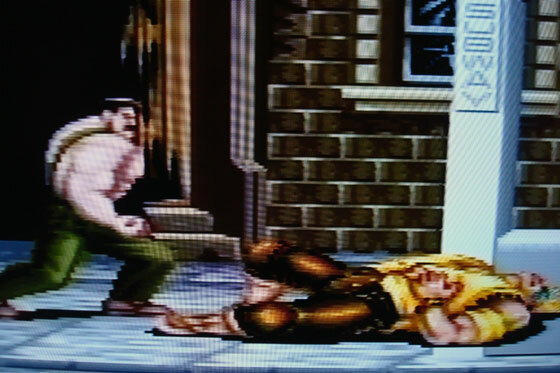 This picture is from Final Fight, a video game for the Super Nintendo. Rather than asking what the picture is of, however, I should be asking you what it signifies. What this picture means is that Matt finally, for the first time in his life, has all of his video game systems set up at once. The reason for this momentous occasion is our new TV cabinet. I’ve never been into video games, but Matt has played his whole life and has built quite a collection. However, it’s always been a case of he would get a new system and the old one would be packed away. On those days when he really wanted to relive his childhood and play his old Sega Master System (the first he ever bought), he was out of luck. 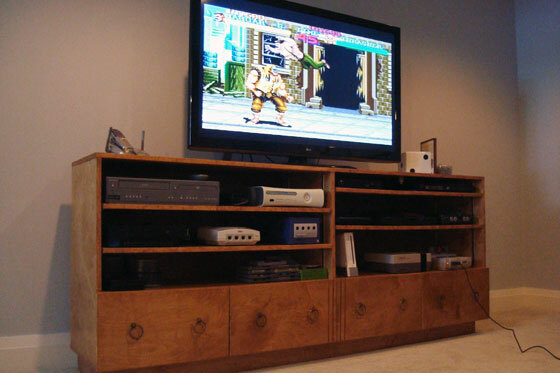 When we were renovating the basement, one of the criteria was to have a good TV area for watching movies and playing games–any game he wanted. So, we needed a TV cabinet. Accommodate all of the equipment: the TV, the satellite receiver, the Blu-Ray player and at least 10 video game systems. Store DVDs and video games. Keep all of the controllers, connectors and wires that come with video games handy but out of sight. Keep everything tidy and organized. I decided my best option was a custom cabinet, so I sketched up a plan, and my Dad and I went to work. We went with adjustable shelves on the top section and drawers on the bottom. 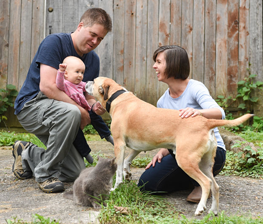 The overall dimensions of the cabinet are 80 inches wide by 16 inches deep by 33 inches high. The top gives us a spot for our phone (we need a land line in the country where cell service is a bit unreliable), our new 50-inch flat screen (more on that later this week) and a little bit of display. The shelves are dedicated to all of the systems. Matt has set up his XBox 360, PlayStation 2, Sega Dreamcast, Gamecube, Sega Genesis, Sega Master System, Nintendo 64, Wii, original Nintendo, Super Nintendo. Holes drilled in the back of the cabinet allow him to poke the wires through to hook up the systems. The best part of the cabinet is the drawers. 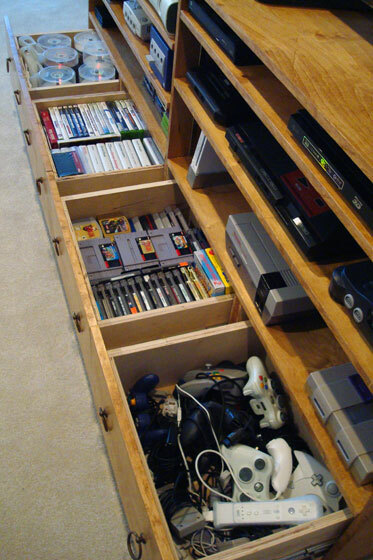 There are four nine-inch-deep drawers along the bottom, and they hold DVDs, games and controllers. As we were building the cabinet, I kept increasing the size of the drawers, and I’m so glad that I did. They hold so much and make it so easy to keep everything tidy. It was a big pain to get four drawers perfectly lined up and sliding smoothly, but I can say now that it was worth it to have everything so well organized. It’s also worth it to see how much Matt enjoys having all of his games at hand. How many of you recognized the picture at the top of the post? Are there any other video gamers out there like Matt? In addition to Haggar and Cody from Final Fight, our basement has also hosted Link, Zelda and Mario over the past few weeks. What’s your favourite game? Have you ever built a piece of custom furniture? Any tips for constructing drawers? 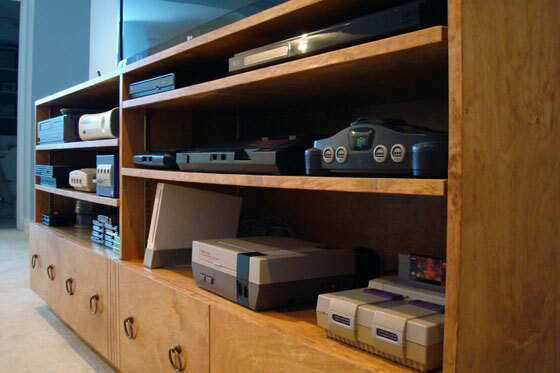 How do you keep video games or electronics organized at your house? Matt has challenged you to a Mario Kart tournament. Any time you want. If it’s Mario Kart SNES he’s talking about, then I accept! You’re on, Dave. I get Toad! Aww, I usually play Toad too, but I’ll use Koopa Troopa. Same specs. I remember that you always chose Toad but the home system gets the first pick. 🙂 When are you coming over? Do I need to set you guys up with a private message board somewhere? What a great entertainment unit! Besides being perfect for what you need, it’s also really nice-looking! Thanks. Aesthetics were very important to me on this one.